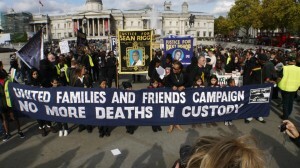 On Saturday, hundreds of campaigners and relatives gathered in Trafalgar Square to march against deaths in police custody, ending in a peaceful sit-in across the road from Downing Street. However, the police reacted violently, attacking two elderly women and detaining a number of protesters. Ceasefire associate editor Adam Elliott-Cooper reports.